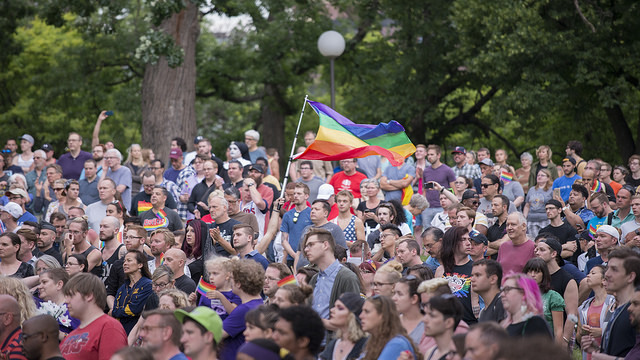 In Loring Park, Minneapolis, MN nearly 3,000 people gathered on June 12th at a vigil in honor of those people from the Orlando, FL LGBT community impacted by the shooter who targeted the Pulse gay nightclub. Photo: Fibonacci Blue | FlickrCC. In the early hours of Sunday, June 12th, 2016, a single shooter fired 202 rounds inside Pulse, a gay nightclub in Orlando, Florida: of 102 people shot, 49 died. Some of the people shot died at once during seven minutes of fire, others during the three-hour assault while police attempted to stop the gunman. The Pulse shooting is the worst mass shooting in modern US history and features the highest death toll attributed to a single shooter. As a nation, we must remember that the shooter targeted the LGBT community and Orlando’s people of color. This assault was not against America in general. Many voices are eager to erase the identity of the victims and want to paint the shooter as just another terrorist who hates our freedoms. Omar Mateen, the American shooter, was killed after police drove an armored vehicle through the wall of the bathroom in which he was hiding. He was born here and raised here. He may have pledged allegiance to ISIS in a call to 911 during the attack. He could as easily have named the KKK or Westboro Baptist Church. He was alone, and his two guns were bought legally on American soil. What makes Mateen a terrorist is not his pledge, or his heritage—both parents are from Afghanistan—but the fact that he saw two men kissing and decided that, because the sight disgusted him, they and anyone like them should die. The shooting has set off a swarm of interest and action around the world. Monuments in LGBT-friendly countries are lit up in the colors of the rainbow, and President Obama dictated that national flags will be at half-mast until Thursday, June 16th. Virgin Air provided free flights to family members of the killed and wounded, and several Orlando citizens made accommodations available for them. Walt Disney World Resort donated $1million to help cover funeral and medical costs, and they weren’t the only donors. It doesn’t matter if these gestures of support are heartfelt or merely political haymaking; they are still signs that terror will not win.